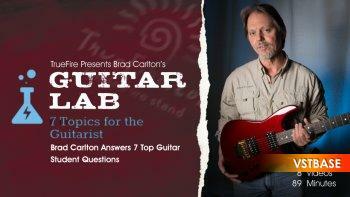 Hi, I'm Brad Carlton, and to celebrate my 100th course with TrueFire, I'm addressing questions about a number of musical topics which were offered by seven different guitarists. Ideally, if we were one-on-one in front of the camera, I would be able to tailor each lesson to each guitarist. But as is always the case, I'll be giving a general overview which hopefully will answer the musical needs of those who view these lessons. For those of you who have viewed my courses, you know what I'm all about. You'll see me in this course operating in the same manner in which I teach privately and have done so for over forty-seven years. That manner involves spontaneity, and indeed I did not plan anything out for these lessons. When I teach, I strive to be in the moment, which keeps it inspiring for both the student and myself. You know how I can go on and on about a topic, and indeed some of these subjects I can do an entire course on, and perhaps will. In closing, I would like to thank all of you for the many years of support and I appreciate the compliments that you've given me. I hope to continue to serve you all by giving you the tools to be able to teach yourself and realize your full potential as a musician who happens to play guitar.